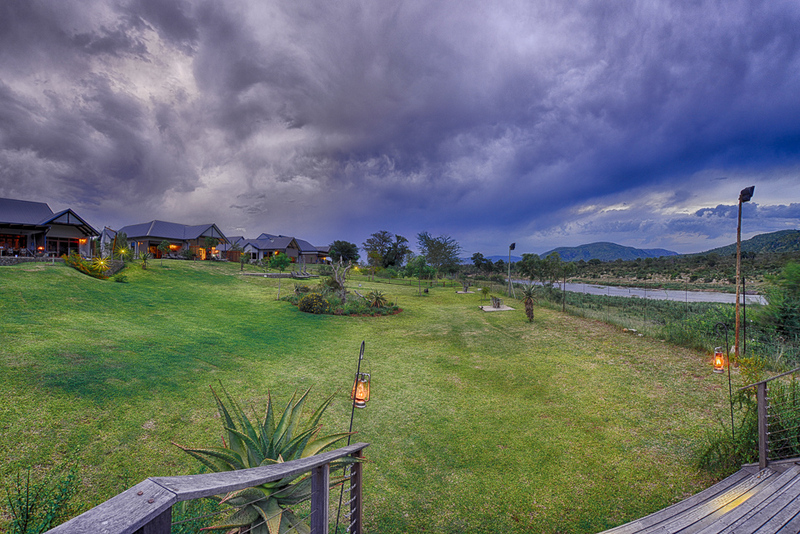 Kambaku River Lodge is situated just off the N4; at the Rockvale turnoff you head 1.8 kilometers down a gravel road through sugar cane plantations to the lodge. 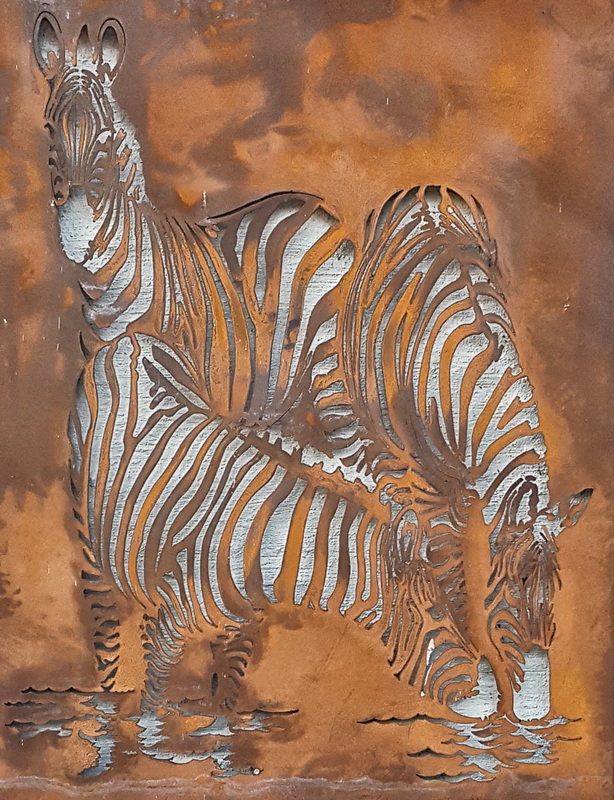 Here you will find it beautifully perched on the banks of the Crocodile River with stunning views into the Kruger National Park. 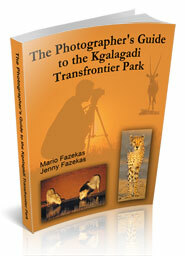 Kambaku River Lodge is only 20 kilometers from the Malelane park gate. 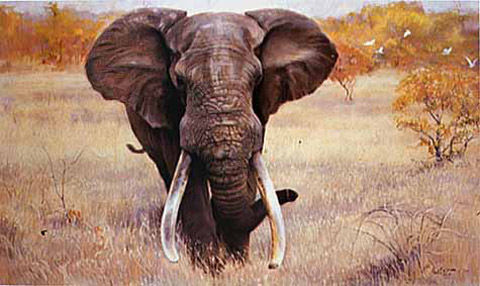 Kambaku River Lodge takes its name from one of the legendary Magnificent Seven big tusker elephants of the Kruger National Park. The Lodge is privately owned and run by two lovely people, Tony and Leanne. On arrival we were warmly welcomed like good old friends; Leanne then showed us round the lodge and helped us to settle in for our 3 night stay. The lodge is very different to what you would expect; Leanne and Tony do things differently and what a nice touch. There is no reception area or main lodge as such but each suite is a lodge in itself. The large viewing deck at the bottom of the lawn provides great views of the Crocodile River and Kruger Park with loads of chairs and tables to enjoy a sun-downer or early morning coffee. 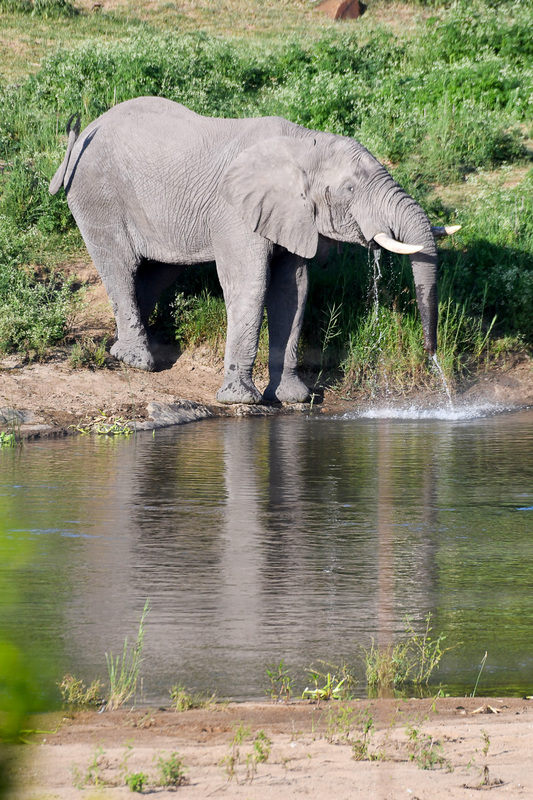 Regular sightings of hippo, large herds of elephant and buffalo, rhino, leopard and other interesting wild life can be viewed from the comfort of your private suite or from the deck. 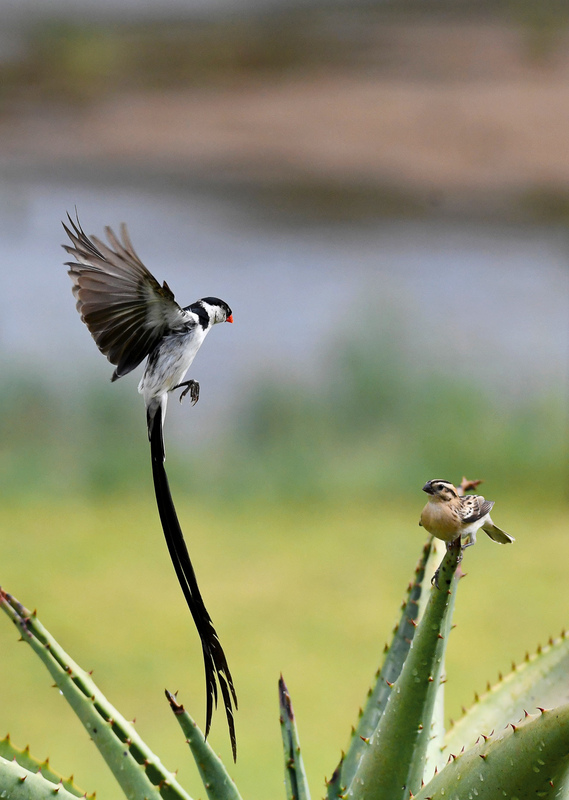 Kambaku River Lodge is a haven for the bird lover with an abundance of birdlife all year round, providing many photographic memories. Wow!! The food and service has to be among the very best we have ever experienced at any of our stays over the years of visiting different lodges! Like I said before, Kambaku River Lodge does things differently – not for the sake of being different but for the guest’s enjoyment and convenience. Small golf carts bring your dinner to you, they are specially designed to carry hot food to each suite. Even though the suites all have fully equipped kitchens for self-catering, you have a choice to self-cater or ask for your meals to be provided. 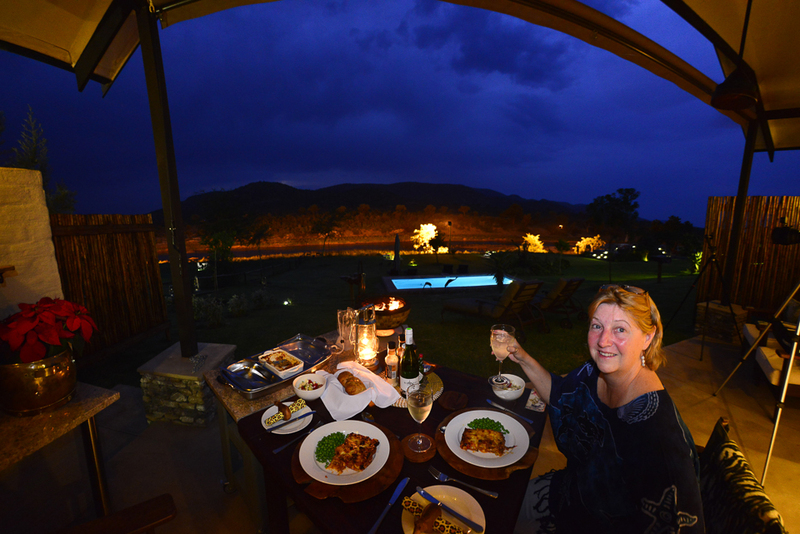 We had three fantastic dinners and two wonderful breakfasts all on our private patio and one breakfast pack. Just before dinner our fire-pit was lit giving that romantic feeling with pure relaxation while we enjoyed our meal with a glass of wine. 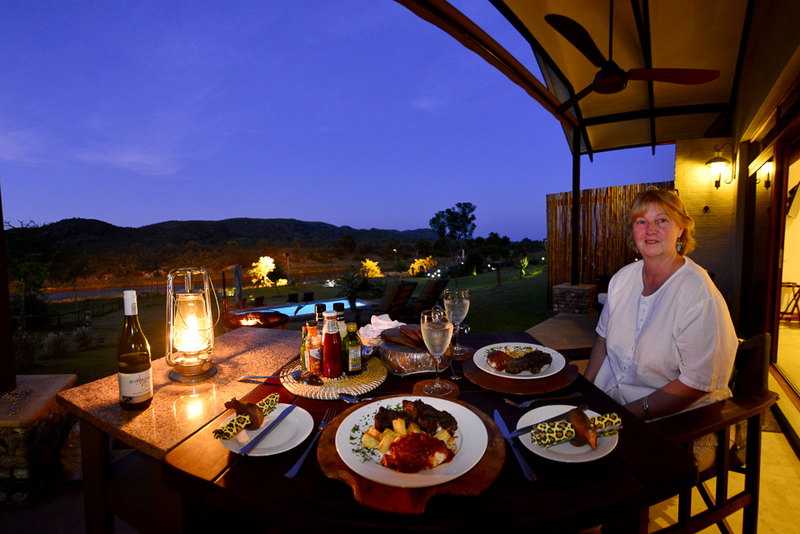 Night 1- we had beautifully cooked lamb chops with pap and sauce, salad and a stunning desert of cheese cake. Night 2 – we had another excellent meal, Lasagna, salad and a great panna-cotta desert. 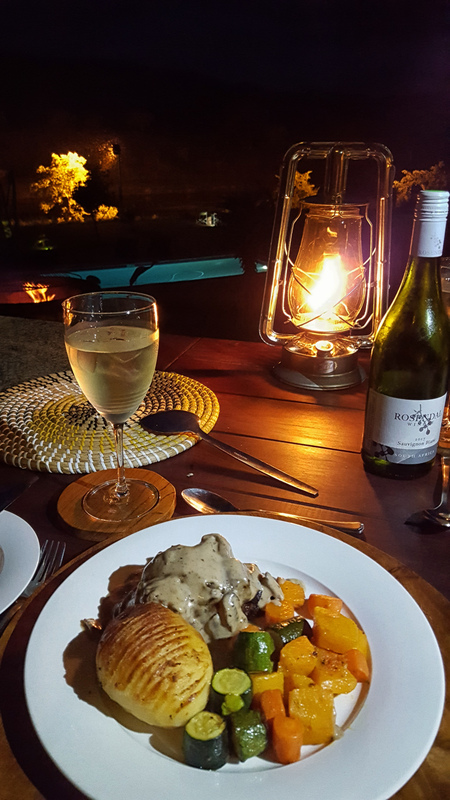 Night 3 – the meals just kept getting better; fillet steak (perfectly cooked) with mushroom sauce, roast potatoes and grilled veg with a fruit Pavlova to die for! Fillet steak with mushroom sauce, roast potatoes, grilled vegetables and a superb bottle of wine! Breakfasts were just as good, and each morning we had fresh fruit juice, yogurt, muesli, carrot muffins, seed toast, cheese, jams and then the hot meal of scrambled eggs or fried eggs, bacon, mushrooms and fired tomatoes- you will never go hungry here! In the middle of the property is the luxurious Kambaku River house that has 3 en-suite bedrooms, an open plan kitchen, lounge, and dining room leading out to a covered patio and its own swimming pool with a lovely view over the river. We stayed in the Joao River Suite which is next door to Shawu River Suite and joined by an inter leading door making it a nice family suite or two separate suites. 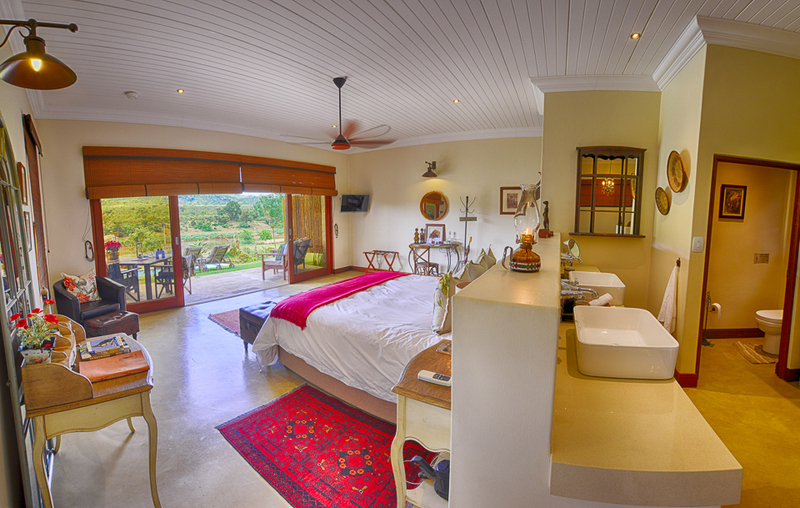 Our suite was spacious and open, I loved showering with the view of the garden and river below. The toilet is separate and the bath with chandelier is a lovely touch. The swimming pool in front of the suites is shared by Joao and Shawu. Mafunyane, on the far right of the property, is the honeymoon suite - it’s an intimate yet spacious suite with king size bed and luxurious finishes. 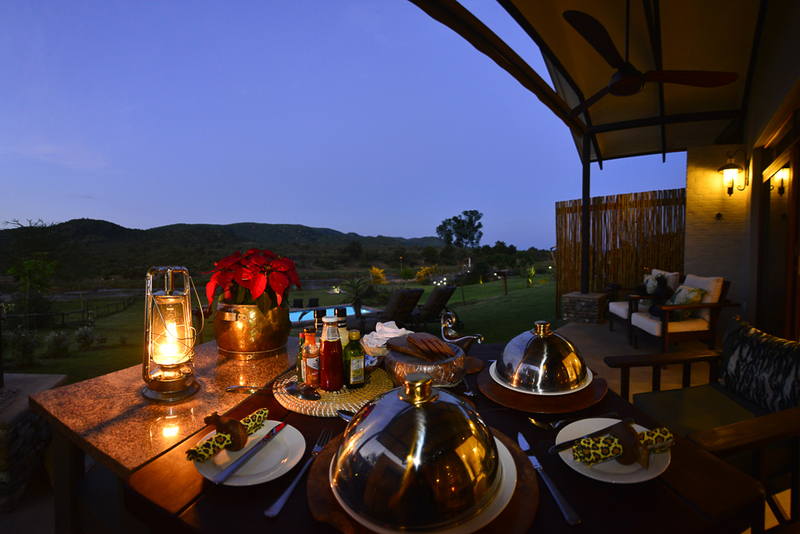 There is a kitchenette and a barbeque/braai area – fire-pit and its own private plunge pool with a superb view of the river. 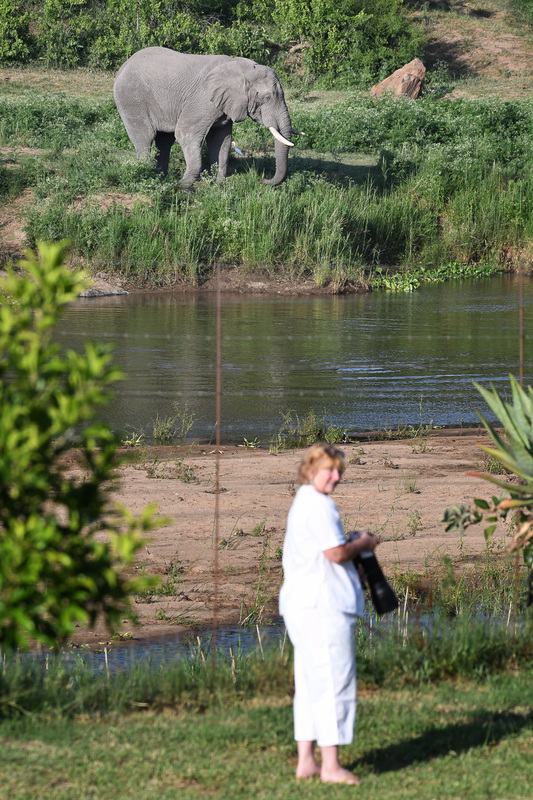 The Shingwedzi River suite is just off the main house next to Leanne and Tony’s house. This suite also has use of the swimming pool in front of Joao and Shawu. 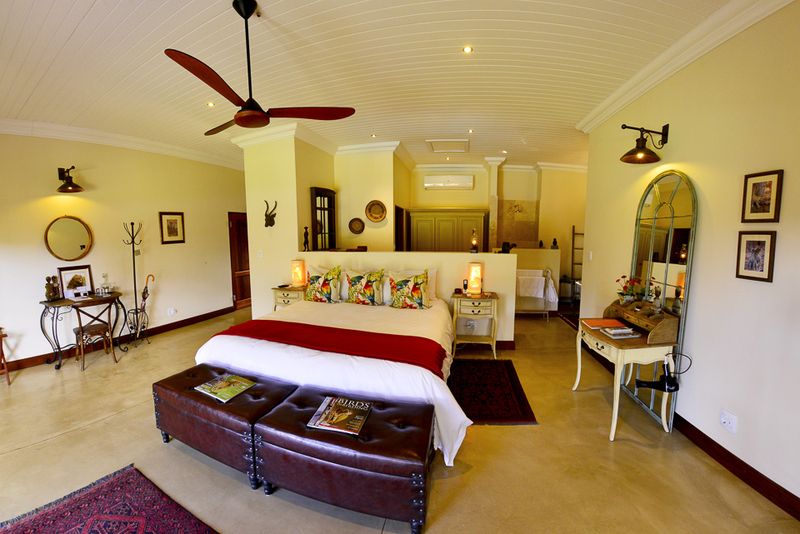 All the suites are elegantly furnished with crisp linen, down duvets and offer either a King size or twin beds and have fantastic views over the lush gardens and the Crocodile River looking into the Kruger National Park. The mini fridge can be stocked on request; we had nice cold water and beers in our fridge on arrival. 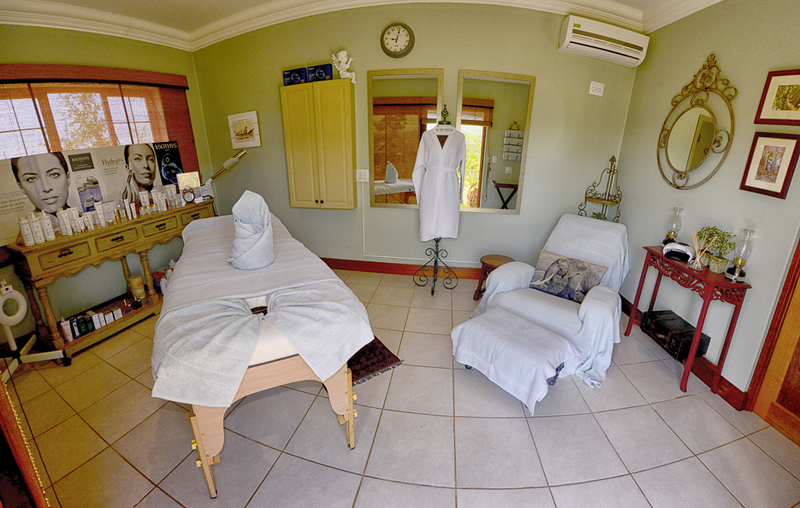 The Dzombo spa is a nice relaxing place for a spa treatment. 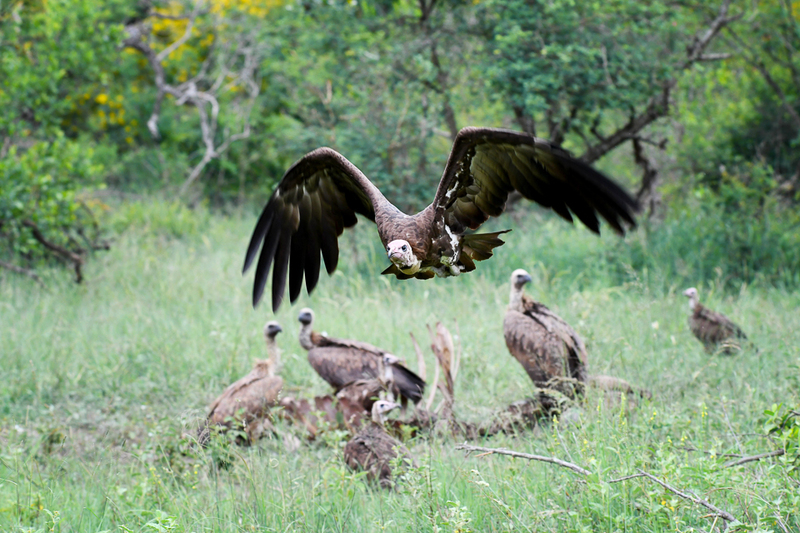 Guided game drives take guests into the Kruger National Park and around other areas, like Blyde River Canyon or a safari walk in the Kruger National Park - all this can all be arranged for you. 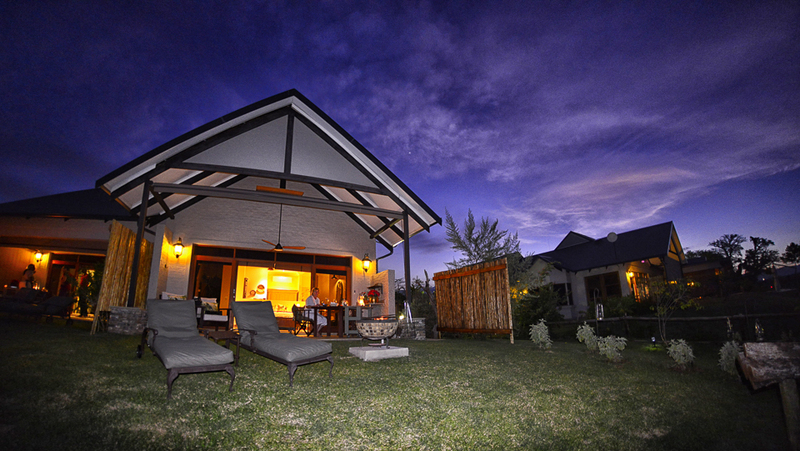 We enjoyed relaxing on our patio and on the viewing deck with our binoculars and cameras ready for action. 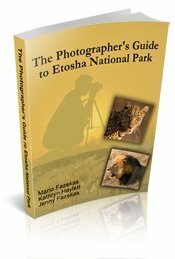 During our 3-day stay we never went into the Kruger once - there was just so much to see and photograph at the lodge that we did not miss going into the park - that is a first for us and says a lot about Kambaku River Lodge! 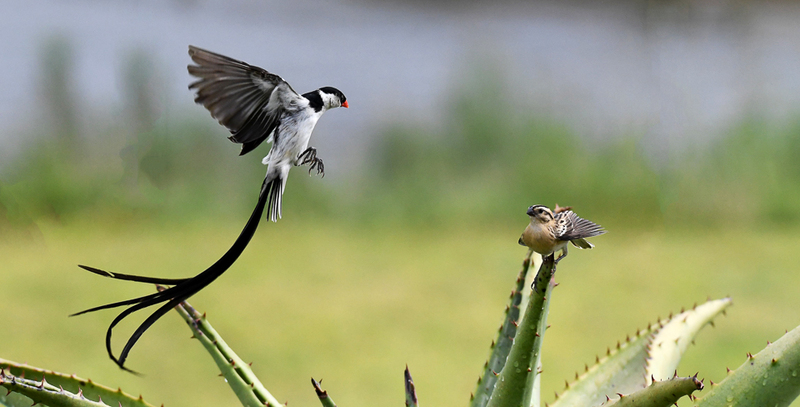 The pin tailed whydah was the boss at Kambaku River Lodge! 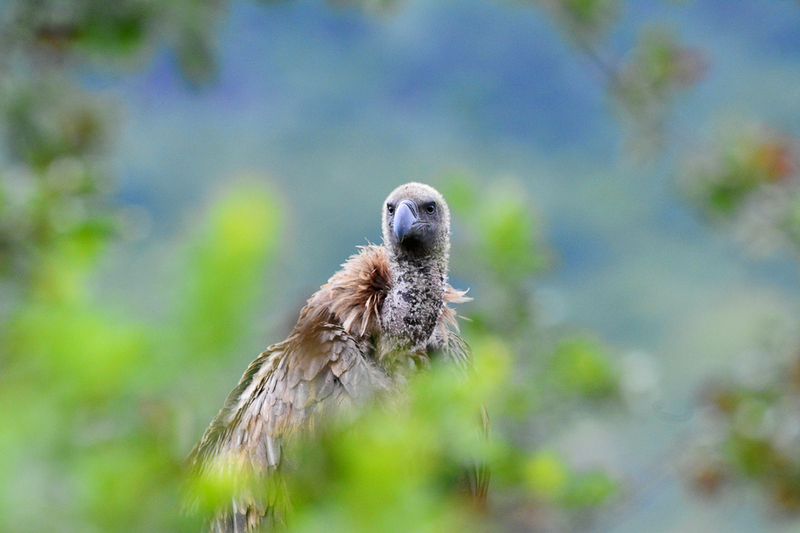 He was courting all the females and chasing the other males - he entertained us everyday! 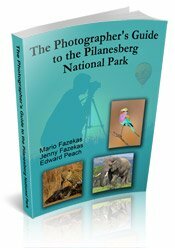 We got to see 4 of the big 5 (rhinos at night but no good photos) and two spotted Hyenas, we also photographed hippos, elephants, buffalo and the many birds like the Woodland Kingfisher and the Pin-tailed whydah that kept us on our toes flying back and forth in front of our patio. 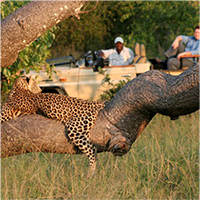 On our last afternoon while relaxing on the patio we heard one of the guests shout “Cheetah”. Mario and I looked at each other, as this isn't ideal cheetah habitat, and made a dash for the deck. 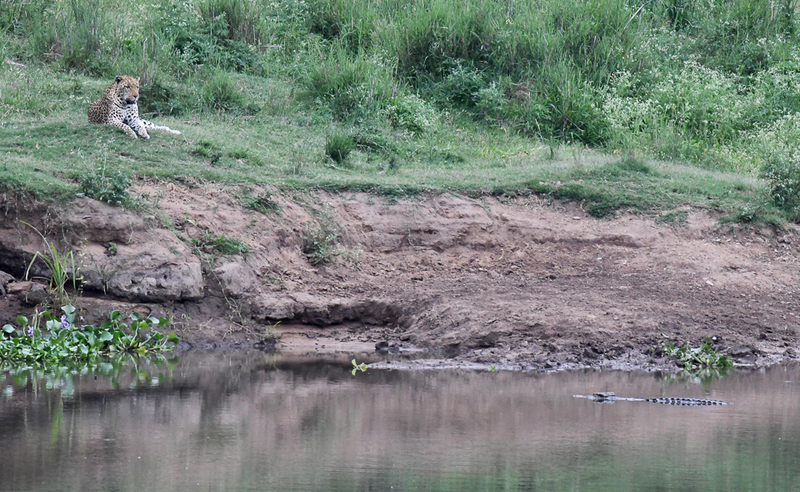 There lying on the far bank was a leopard. Everyone including Leanne and Tony came to photograph the leopard. 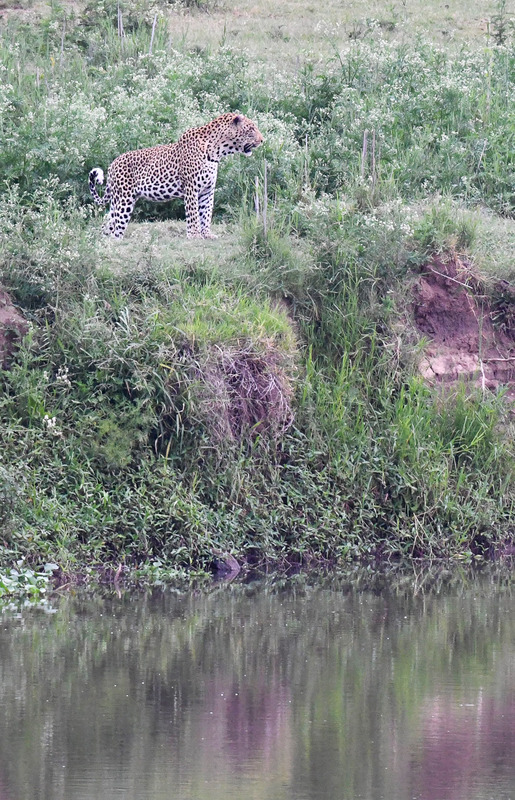 The leopard came strolling along the river, stopping every now and then to scan his surroundings and wonder what all the excitement was from the Kambaku deck! It was such a great end to our three night stay and will not be forgotten. 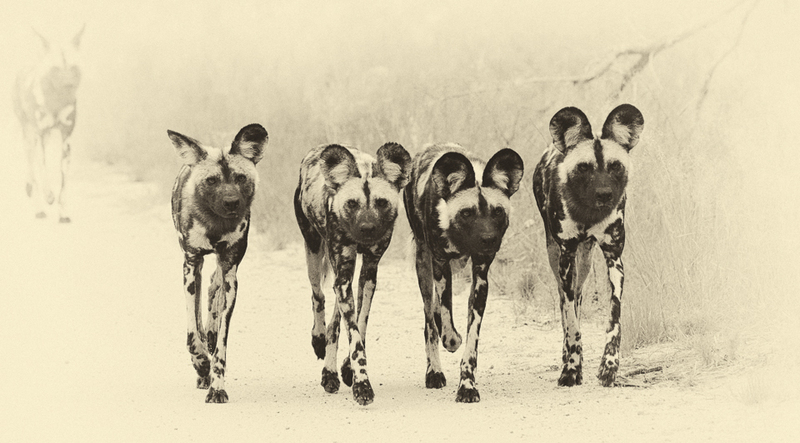 We left early on our last morning as we were heading up to Letaba Camp for four days and we had far to travel. 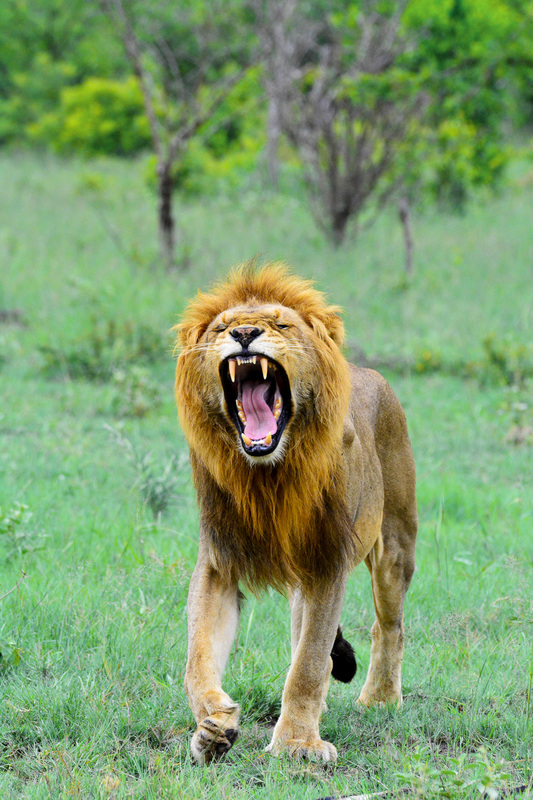 We saw lions near Berg en Dal - so there was our Big-five sighting for our Kambaku River Lodge stay! 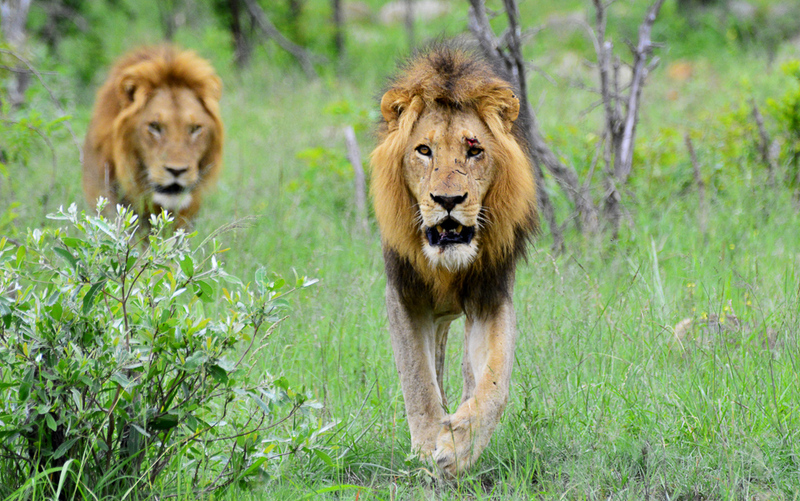 We found the lions as we saw vultures on a kill and assumed the lions may still be in the area. 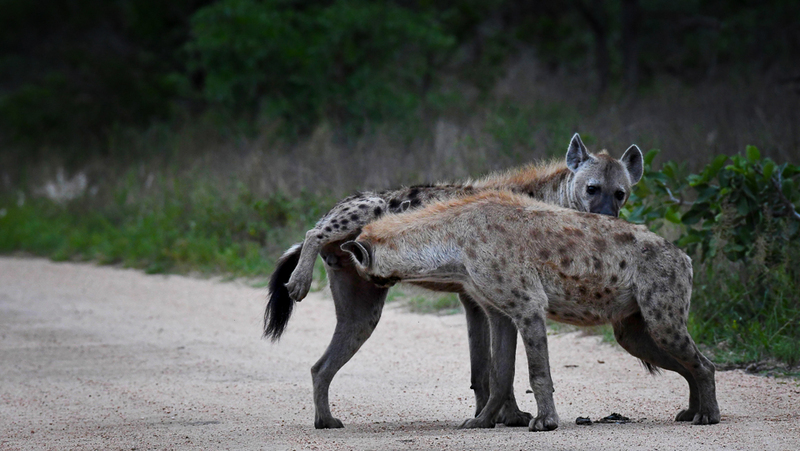 and hyenas that were eating the wild dog feces and then smelling each other...! If you want to stay outside the Kruger National Park but still be a part of the Kruger, then Kambaku River Lodge is the perfect place to be! 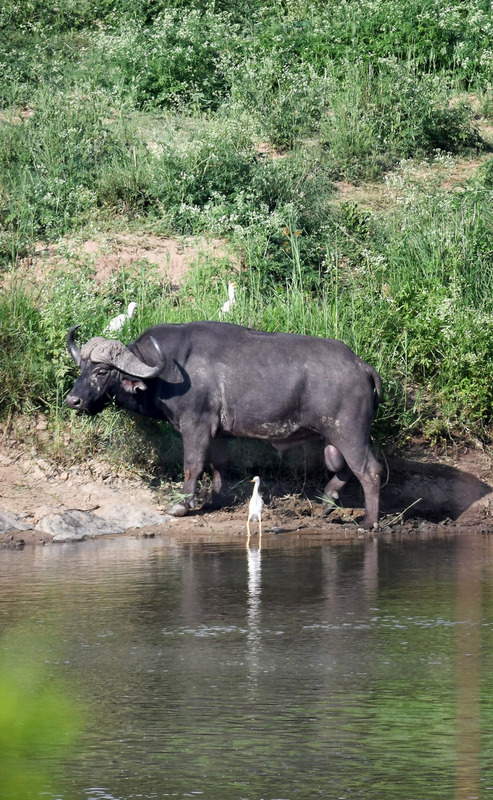 We usually can't wait to get into the Kruger Park each day but we had no desire to leave Kambaku River Lodge for the three days we were there so that says a lot about the lodge's food, service, location and ambiance! Thank you Leanne, Tony and their wonderful team for everything, you guys truly know how to make your guests feel special.